It was originated to launch by private independent team of Haruji Yoshinaga in 1949 after high evaluation of our hard fighting works for repairing the facilities at “Nagasaki, Haiki” railway station yard which we have done just 6 month period enable to reopen the railway operation and business. In that time, “Haiki” railway station have been completely destroyed under flood water due to the heavy rain storm attacked to Nagasaki prefecture in 1948. 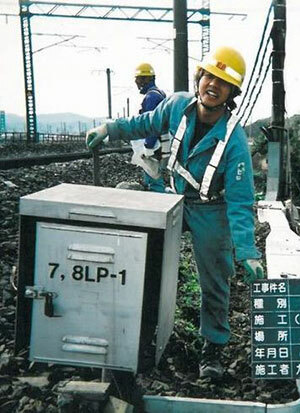 Since that time, our company used to taking care deeply of the railway security facilities. At the beginning time, our company has been in applying the mechanical type signal security system combined with square sectional shape steel bar with notch and special piece called “Koma” in Japanese. After many years eventually, mechanical signals have been transferred to a relay interlocking equipment utilizing relay sequence and electronic interlocking device. On the other hand, knowhow of mechanical signal system is to be still applied to mechanical parts such as turnout device, point device, etc. On this our history, we are proud of still specialist in the field of rail turnout device and rail point device combined with mechanical components on the basis of technology for mechanical type signal system which we used to pile up the knowhow in this field up to today. Of course, any technology should have progressing and improving year by year. We are doing our best to master update technology as well as engineering works. It is even no more skilled mechanical technicians available in this railway industry, we are confident that it is still good opportunity for us to expand the business concerned on the above reason. 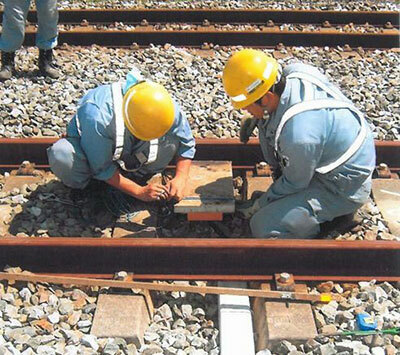 We have been involved in construction for railway signal security facilities since 1949. On these experiences, it was successful for us to build new idea of HP type rail bond and silver alloy brazing method. On the another viewpoint of construction site, we used effort to support and back up the technical development toward new working method. We will do our best to generate new technology in the field of railway stable operation with signal security facilities.